CHICAGO, Illinois, January 30, 2019 (ENS) – One of the coldest Arctic air masses in recent memory is pushing south into the Upper Midwest and spreading across much of the eastern two-thirds of the country. The bitter cold stretches from the Dakotas east to Maine, with snow expected as far south as Alabama and Georgia. Parts of the Midwest are seeing their coldest weather in at least two decades. Wind chill values will fall into the 40s, 50s, even 60s below zero in some places, according to meteorologist Domenica Davis with the Weather Underground. The temperature plunged to minus 30 degrees Wednesday morning at the National Weather Service office in La Crosse, Wisconsin, says Davis. The NWS office in the Twin Cities, Minneapolis and St. Paul, observed that Wednesday was the coldest morning in southern Minnesota and western Wisconsin since 1996. It’s expected to remain below zero there until Friday morning. Wind chills Wednesday morning plunged into the 50s below zero as far south as central Illinois, northwest Indiana, and across the Chicago and Milwaukee metro areas. Wind chills in the 60s below zero have been recorded in parts of Minnesota, North Dakota, even as far south as northeast Iowa, where Charles City registered that bone-chilling value just before midnight Tuesday night. A minus 66 degree wind chill north of Ponsford, Minnesota, Tuesday evening is the coldest temperature recorded across the country during this Arctic blast. Thursday morning is likely to be even colder for some in the Midwest, meterologists predict. Strong winds and life-threatening wind chills in the Midwest could lead to frostbite on exposed skin in a matter of minutes, especially threatening to the homeless. On Tuesday, the Midwest was the hardest-hit region, as temperatures dropped below zero degrees Fahrenheit (-18° Celsius). By dusk the thermometer was at 0°F in Chicago, Illinois; 7°F (minus 14°C) in Detroit, Michigan; and minus 21°F (minus 29°C) in Minneapolis, Minnesota, where a wind chill warning is also in effect. As much as two feet (60 cm) of snow is forecast for Wisconsin, and six inches (15 cm) in Illinois. Snow is expected through Wednesday from the Great Lakes region into New England. Across the Chicago area, by 6 am today, temperatures were down to minus 22, with a wind chill of 49 degrees below zero. Amtrak and several other rail lines have suspended service. About 19,000 ComEd customers are without power. State agencies, courts, zoos, museums and the planetarium are closed. Chicago public schools are closed, affecting more than 300,000 students. “Student safety is our top priority and the temperatures are expected to drop to extreme and dangerous levels on Wednesday, which could present a hazard for students,” Chicago Public Schools Chief Executive Officer Janice Jackson said in a statement. Postal workers will not be delivering mail in six states, and parts of four others. States affected are: Illinois, Iowa, Minnesota, North Dakota, South Dakota, Wisconsin, and parts of Kansas, Missouri, Montana and Nebraska. In Minneapolis-St. Paul, frostbite cases are appearing at Twin Cities hospitals. Mail is not being delivered, public schools and colleges are closed, along with museums and other public buildings. But one event the freeze is not shutting down is the Winter Carnival in St. Paul. The icy sculptures are gleaming, men are practicing for the frozen bean bag toss, and singers are rehearsing for the music events. Most Winter Carnival events are free, open to the public, and will take place in downtown Saint Paul, near Rice Park and Landmark Center, as well as at the Minnesota State Fairgrounds. The St. Paul Winter Carnival continues through Sunday. 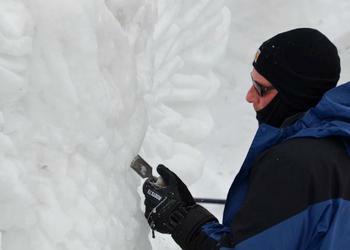 In Frankenmuth, Michigan 2019 the Zehnders Snowfest is in full swing with the World Class Snow Sculpting competition and other icy events. Residents just to the north and northwest of the Twin Cities are being asked by Xcel Energy to dial down their thermostats to 60 degrees because the utility is “experiencing a significant strain” on its natural gas system. Xcel said 150 customers in Princeton have lost natural gas service; Xcel has put them up in hotels while it restores service. Even essential roads are not being maintained. The Minnesota Department of Transportation pulled snowplows off the roads in 11 southeastern counties because of the extreme cold. 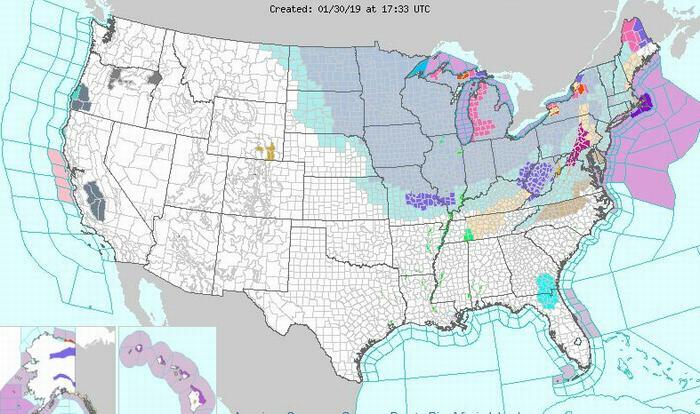 Today, flight departures are being delayed on the ground at Chicago’s O’Hare International Airport, and in New York at La Guardia and Newark airports and arrivals destined for San Francisco are being held on the ground as well, according to the Federal Aviation Administration. More than 1,000 flights were canceled or delayed in anticipation of snow and icy conditions Tuesday, as the storm threatens the Midwest, the South and the East Coast regions of the United States. Because the Earth continues to warm does not mean we’re going to see winter disappear. Record low temperatures will still happen every now and again, but much less often, say weather forecasters. In the 1950s, the United States saw about the same number amount of record high temperatures as record low temperatures. In the 2000s, that ratio jumped to nearly two to one in favor of record highs over record lows, according to a study published by the American Geophysical Union. This cold wave might be one of the last that the United States will ever experience. Another new study shows extreme heat events both in the summer and in the winter are increasing across the United States and Canada, while extreme cold events in summer and winter are decreasing. The roots of this dangerously cold snap in the Midwest lie in an episode of sudden stratospheric warming – a rapid increase in temperature in the typically-frigid air above the North Pole that took place at the end of December – which caused the polar vortex to split. The polar vortex is a large zone of low pressure and cold air that always exists near both of the Earth’s poles in the stratosphere, a few miles above ground level. The vortex weakens in summer and strengthens in winter, the National Weather Service explains. When the polar vortex splits, pockets of Arctic air that normally stay near ground level over the North Pole are free to move southward into Canada and the United States.